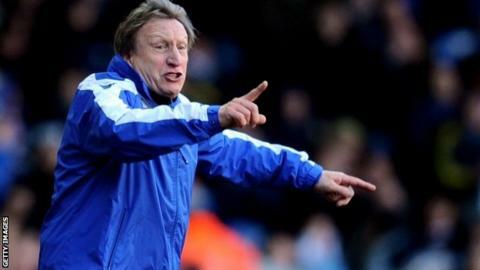 Leeds boss Neil Warnock feels his side's shock FA Cup win over Tottenham has lifted the mood at the club. "It's a fabulous day for everybody," he said. "Not just because we won, but a few weeks ago there was a little bit of dissent around the place." Some Leeds fans criticised Warnock's side after their defeat by Barnsley in the Championship earlier this month. He added: "Today it was a marvellous atmosphere and, when they are like that, the crowd are a different class." Leeds, who will play Manchester City away in the fifth round, took the lead through an early Luke Varney goal and doubled their lead through Ross McCormack's second-half strike. Tottenham, who are fourth in the Premier League and have reached the semi-finals in two of the last three seasons, hit back through Clint Dempsey's header but were unable to turn their superior possession into clear-cut chances and Leeds held on to win 2-1. "It was a typical FA Cup game," added Warnock. "They were like that when I was a kid. "They played a strong team. To see Gareth Bale, Aaron Lennon and Scott Parker in that team and to beat them is fabulous because we had a very young side out. "I thought we took care of Lennon and Bale very well. We scored two great goals and could have had a couple more. It was a fabulous advert for Leeds and the FA Cup. "It was a great result and we deserved it. Some of our defending in the second half was fabulous. "I'll probably open a bottle of champagne tonight and have a few little tipples. I'm sure I'll be able to do something like that. I might even treat myself to a bag of crisps." Bale and Lennon were kept quiet by Leeds' pair of young full-backs Sam Byram, 19, and Aidy White, 21. Leeds are into the fifth round of the FA Cup for the first time since 2003, when Terry Venables was manager and they reached the quarter-finals before being beaten by Sheffield United. They also reached the quarter-finals of this season's Capital One Cup, beating Southampton and Everton before losing 5-1 to Chelsea. "I thought Aidy and Sam got done occasionally, but they've learned so much today against top-class opposition," Warnock added. "It's not very often that Lennon has as an ineffective game as he did today, and we handled Gareth well too." Leeds are in the fifth round of the FA Cup for the first time in a decade and reached the quarter-finals of the Capital One Cup earlier this season. But their league form has been patchier and they lie 11th in the Championship, six points off the play-offs, after losing their last four away league games. "We've had negative press on some of the results lately and yet we've won six league games on the trot at home," Warnock said. "But in Leeds the glass is always half empty, it's never half full in Leeds. That might be a Yorkshire trait."